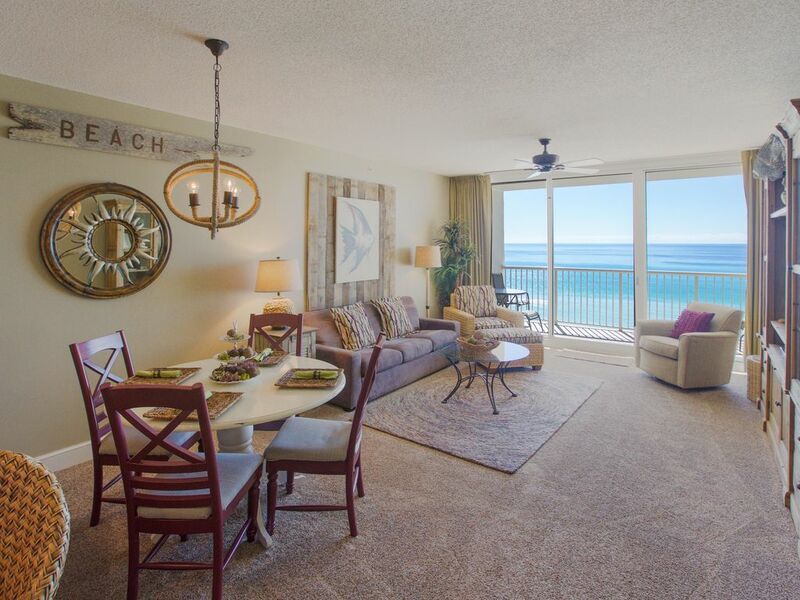 Ocean Front with Majestic Views, Free Beach Chairs and WIFI too! Completely renovated in spring of 2014 and continually updated. Beautifully appointed with all new furnishings. MAJESTIC BEACH TOWERS located at 10811 Front Beach Rd. ASK FOR THE MAJESTIC Unit #503 Tower 2 if you want the 2 bedroom/2 bathroom unit that SLEEPS 7 and is on the 5th floor in the east tower. Bedroom 1 has king bed, bedroom 2 has bunks with twin on top and full on bottom, living room has queen sleeper sofa. PHOTOS SEEN HERE ARE TRUE REPRESENTATION OF UNIT AND BALCONY. WE HAVE SPECIALLY RESERVED TWO BEACH CHAIRS W/ UMBRELLA FOR YOUR USE WHILE AT MAJESTIC ABSOLUTLEY FREE! * $200 reservation/damage deposit is refunded after check out. * Parking passes $10 each. For rental property and personal use. Great location, directly on the beach. Convenient to restaurants and other activities. All Condos have at least 3 pools on site. The condo is huge, very clean, very nice! The decorations are all beautiful! I would definitely stay here again! Wonderful unit, complex and area. Carol and Tom, it is always a pleasure having you as our winter guests! This is not a condo, this your home at the beach!. This condo is gorgeous! We stayed a week and needing nothing, it was all there. The furnishings, decor and bedding are not cheap rental stuff. It was beautiful high quality stuff that made you feel like you were staying in a place that cost much more. The condo was super clean, beyond completely stocked and spacious. From the start Vycki was extremely efficient. I like to know what I am doing before I do it and that was easy with Vycki. She made sure we had everything we needed well in advance and was quick to respond if I did have a question. We would definitely stay here again. Thank you so much for this lovely review. We are so happy to hear that you enjoyed and appreciated our condo. We welcome you and your family back again soon! So glad that we decided to book and stay here for our quick weekend getaway! Vycki was very quick to respond and answer my questions! We were mailed our parking pass, and didn't have to worry about checking in, got our key code to the door and were able to just straight to the room upon our arrival. We were traveling to the area with a 19 ft. trailer and the resort security was very accommodating in helping us park it in a safe, monitored place on their property! Our truck is over 7 ft. tall and they had special parking for vehicles over 7 ft. tall which was awesome! The elevators were very fast! We were in tower 2 on level 5, and had no problem what so ever each time we needed to use the elevator! With us only staying 2 nights we didn't have to use a cart, we just carried our luggage to the room, but we saw plenty of carts in the lobby area! There is a ton of remodeling and construction going on from Hurricane Michael, so take that into mind when staying here. We were patient and never let it bother us! Our room was exactly like the pictures but more beautiful in person! The condo was spotless and smelled very fresh and clean! The view was to die for....very pretty! We didn't use the kitchen area during our stay since it was such a short stay we ate out. The bathrooms were very clean and had everything we needed! The beds were very comfy and we slept amazing each night! It was nice to have a washer/dryer in the condo, I did use it once. We did go to the indoor pool once during our stay. It was heated and very refreshing! Loved that the beach was just a very short walk! It was clean! Everyone we came in contact with was very friendly and nice! I could go on and on about how much we LOVED our stay! We will for sure book with Vycki again!! And, would recommend anyone to book any of her condo units! Thanks Vycki!! Joanie, thanks for taking the time to post such a thorough review! There is indeed some construction to the road going on right in front of Majestic but the end result will be amazing. They are giving all of the beach road a face lift, adding landscaping, sidewalks etc and the end result will be worth the little bit of inconvenience. I know you came to town for a work trip related to the hurricane damage so I hope you will be able to make it back soon for a longer, more relaxing trip! This condo was beautiful, clean and well managed. Thank-you! 3 night minimum for certain seasons. No smoking and no pets Minimum age is 25 for all unmarried renters.